All gas sensors require calibration for precision output. Note that the sensor is sensitive to multiple gasses - but cannot tell which it is! That's normal, most gas sensors are like that - so it is best for measuring changes in a known gas density, not detecting which is changing. This breakout board is not for any safety, medical or finished product usage. We're selling it for hobby education & experimentation and don't guarantee it for any other purpose! Note that the sensor is sensitive to multiple gasses - but cannot tell which it is! That's normal, most gas sensors are like that - so it is best for measuring changes in a known gas density, not detecting which is changing. 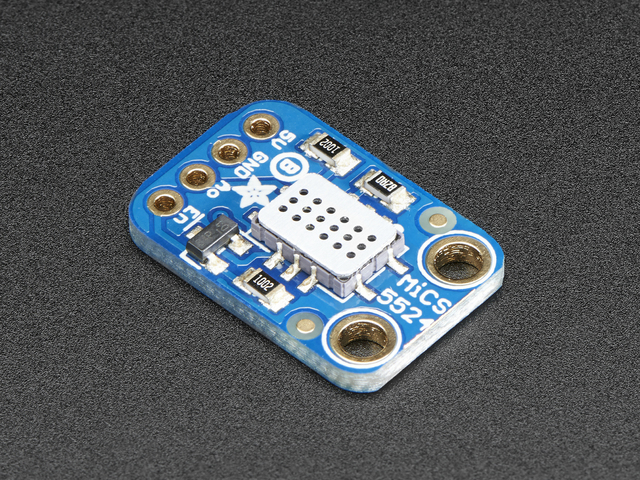 Each order comes with one assembled and tested MiCS-5524 breakout and a small amount of header. You'll need to do some light soldering to attach the header on - or you can use just plain wires. This guide was first published on Jul 13, 2016. It was last updated on Jul 13, 2016. This page (Overview) was last updated on Apr 25, 2019.